We’d love your help. Let us know what’s wrong with this preview of Chase Darkness with Me by Billy Jensen. Journalist Billy Jensen spent 15 years investigating unsolved murders, fighting for the families of victims. Every story he wrote had one thing in common - it didn't have an ending. The killer was still out there. But after the sudden death of a fr Have you ever wanted to solve a murder? Gather the clues the police overlooked. Put together the pieces. Identify the suspect. In Chase Darkness with Me, you'll ride shotgun as Billy identifies the Halloween Mask Murderer, finds a missing girl in the California Redwoods, and investigates the only other murder in New York City on 9/11. You'll hear intimate details of the hunts for two of the most terrifying serial killers in history: his friend Michelle's pursuit of the Golden State Killer which is chronicled in I'll Be Gone In The Dark, a book Billy helped finish after Michelle's passing, and his own quest to find the murderer of the Allenstown 4 family. To ask other readers questions about Chase Darkness with Me, please sign up. I came into this book with no expectations. I've listened to My Favorite Murder since the beginning and was familar with Jensen as a result of the podcast (which he was a guest on during the GSK drama) and the book he helped complete after Michelle McNamara's death (I'll be Gone in the Dark). In this book, Jensen takes the reader through his childhood, when his father would show him newspaper articles about criminals being caught. This was the beginning of his love of true crime, which lead to h I came into this book with no expectations. I've listened to My Favorite Murder since the beginning and was familar with Jensen as a result of the podcast (which he was a guest on during the GSK drama) and the book he helped complete after Michelle McNamara's death (I'll be Gone in the Dark). In this book, Jensen takes the reader through his childhood, when his father would show him newspaper articles about criminals being caught. This was the beginning of his love of true crime, which lead to his job as a crime journalist. However, after seeing crime after crime go unsolved, he decided to start solving them on his own using social media and the few contacts he had. He then details a slew of unsolved crimes/missing persons cases he has helped solve. If you're looking for a true crime book about big, flashy cases, this isn't it. The crimes he helps with are "run of the mill" crimes- murder at a taco bell, man murdered outside a bar, etc. However, there is one exception, and that is his assistance with the Golden State Killer/EAR/ONS. The book ends with a call to arms for "citizen detectives" and a how to guide- this dovetails nicely with his new podcast The Murder Squad. Billy Jensen is fantastic - need I say more? No.. but I will. Chase Darkness With me is an in depth look into investigating / solving murder cases. It's extremely personal, inspiring, motivational, gut-wrenching and devastating all rolled into one. He shares his story of getting to know Karen and Georgia (if you don't know who they are.... I have no words,) Paul Holes and Michelle McNamara. I read I'll Be Gone in the Dark last year and I feel as though Jensen's book is a great companion to it as Billy Jensen is fantastic - need I say more? No.. but I will. He shares his story of getting to know Karen and Georgia (if you don't know who they are.... I have no words,) Paul Holes and Michelle McNamara. I read I'll Be Gone in the Dark last year and I feel as though Jensen's book is a great companion to it as it Evil Has a Name. Jensen tells us of his relationship with McNamara and how he helped finish her incredible book for her after she passed away. The guy has so much drive and passion for what he does and it shines through so brightly in this book. I loved it. I loved getting to know him more, too. I laughed, I cried... this book really will captivate you. Margitte I don't know who Karen and Georgia are. Please enlighten me. This sounds great. Inspiring, refreshing and raw. This book will bring you to tears, make you laugh, and reignite your passion of true crime. Billy’s honesty about his struggles and failures of solving cold cases is sometimes crushing but the victories and way he writes about Michelle McNamara/GSK really brings this book full circle. The addendum is inspiring and very instructive, and the ending will give you full body chills. I first became familiar with Billy Jensen when I was reading I'LL BE GONE IN THE DARK, as he helped finish the book after Michelle McNamara passed away. I've also heard him speak as a guest on various podcasts, and on his own podcast THE MURDER SQUAD. It was pretty clear when I heard that he'd written his own book and was going to perform it in an Audible exclusive that I would be getting that book. And after waiting not so patiently, I finally got CHASE DARKNESS WITH ME on publication day. Billy I first became familiar with Billy Jensen when I was reading I'LL BE GONE IN THE DARK, as he helped finish the book after Michelle McNamara passed away. I've also heard him speak as a guest on various podcasts, and on his own podcast THE MURDER SQUAD. It was pretty clear when I heard that he'd written his own book and was going to perform it in an Audible exclusive that I would be getting that book. And after waiting not so patiently, I finally got CHASE DARKNESS WITH ME on publication day. Billy Jensen is a true crime reporter who, fed up with seeing cold cases fall by the wayside, made it his personal mission to try and get tips and clues to try and solve cases that were unsolved. CHASE DARKNESS with me is an account of his process in collecting information and getting it out to the public, the various cases he's worked on, and his relationship with Michelle McNamara and her investigation into the Golden State Killer, before and after he death. Jensen has an affable and relatable tone, and listening to him tell his own story was a true delight. I enjoyed his insights into looking into cold cases, as well as hearing about his past and why it is that he became interested in true crime in the first place. I had heard of a few of the cases that he touched upon, and was very fascinated to hear about the various steps he takes when approaching a new case when trying to get information. I also found his reminiscence about McNamara and their friendship to be very bittersweet, and found myself tearing up a couple of times. I also really liked the addendum at the end, telling people what steps they can take if they want to see if they can gather information on cold cases like he does. It was pragmatic and straight forward, and while I myself could NEVER see myself taking the steps to do such a thing, I could see the value in it. Realistically, I would give this 3.5 stars. I really enjoy Billy on the Podcast “The Murder Squad” with the Mirderino’s collective imaginary boyfriend, Paul Holes, bit I found myself really put off at times during this book. I loved the parts where Billy talked about his father and how his father fed his love of true crime and his sense of wanting justice for victims. I admire that he used so much of his own money on targeted ads meant to help identify murder suspects. I appreciate his love of t Realistically, I would give this 3.5 stars. I really enjoy Billy on the Podcast “The Murder Squad” with the Mirderino’s collective imaginary boyfriend, Paul Holes, bit I found myself really put off at times during this book. Despite the things that I did like, there were just as many things that I didn’t care for. I’m most concerned that he is giving so many people tips on how to be a citizen crime solver. Although people may go into this with the best of intentions, I’m not sure that it’s really wise to pick a cold case, contact the family, the detective, and start working on it. While it may have worked for him, he has the advantage of being a tall, white man who, statistically speaking has less of a chance to become a “random victim”. His privilege is showing in the sense that what works for him, may not work for a woman or person of color who may be more likely to be harmed if they are in the wrong place at the wrong time. He did emphasize that people should not be doing this alone but he also gave examples throughout the book on how he did may of these things on his own. Admittedly, I went into this audio book with zero expectations. Initially I tried to order a physical copy before I discovered that it is being released as only an audio book at this time. I am an avid reader and podcast listener (predominately true crime). I discovered Billy Jensen because of My Favorite Murder (#SSDGM) and Michelle McNamara's book, I'll Be Gone In the Dark. Billy Jensen is a crime writer and citizen detective. 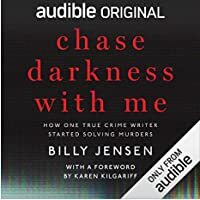 Billy Jensen and Michelle McNamara were friends and colleagues in th Admittedly, I went into this audio book with zero expectations. Initially I tried to order a physical copy before I discovered that it is being released as only an audio book at this time. I am an avid reader and podcast listener (predominately true crime). I discovered Billy Jensen because of My Favorite Murder (#SSDGM) and Michelle McNamara's book, I'll Be Gone In the Dark. Billy Jensen is a crime writer and citizen detective. Billy Jensen and Michelle McNamara were friends and colleagues in the true crime journalism and citizen detective arena. After I finished listening to Chase Darkness with Me, I immediately asked a fellow Murderino if she had listened to it yet. I described it as similar to a long true crime podcast. I would recommend this audio book to anyone who enjoys true crime podcasts. Billy Jensen describes how he came to be fascinated with writing about and solving crimes. He talks about the ups and many downs that come with being a citizen detective and crime writer. He also speaks about his relationship with Michelle McNamara and how he came to finishing her book after her sudden passing. The final part of this book is a "how to" for becoming a citizen detective using social media. I absolutely loved this book. I devoured it. It spoke to my soul as a true crime junkie, but its so much more than a just true crime book. It’s also is truly a story of compassion and doing good in the world. The story has everything, humanity drips off of every page. I laughed, I cried(bawled), I felt heartbroken, I felt inspired. It’s an absolute must read for anyone that read I’ll Be Gone in the Dark. I came to this book through My Favorite Murder and I'm so glad I did. I really enjoyed Billy's narration and perspective. It's really nice to hear the motivation of someone outside of law enforcement to help solve cold cases in a way that seems very accessable to readers. The fact that the last chapter of the audiobook is a guide to getting started being a citizen detective yourself really speaks to why Billy does what he does, to get justice for victims. This was so good! I was enthralled by Billy’s work on unsolved cases. It’s amazing the help he was able to provide to the police and his ideas of how to help utilize baby boomers as they retire are really interesting. If you like true crime, give this a listen! One of the most moving, amazing, and brilliant books I've ever read. I found myself with tears in my eyes many times while reading this book. I would sign up for Billy's online sleuth group anyday in a heartbeat! Michelle McNamara would be proud. I thoroughly enjoyed this book! The subject matter was captivating, and I was particularly struck by his ethos of justice and connection—regardless of how he may view it, his work is really entirely wrapped up in the human connections we share. I was impressed by the author's tenacity to stick with unsolved cases and his ingenuity in using present day techniques to revisit the case files on unsolved crimes without any other reward than the satisfaction of helping the families of crime victims. Every true-crime fan should add this to their list! If you are a fan of true crime this is the book for you! It will make you laugh, cry, cheer and want to solve a crime yourself! Really interesting to hear the process and about the cases he has worked on. Sometimes it was difficult to keep up with all of the different cases. Not a big fan of audiobooks but this one was spectacular. I found myself not even paying attention to how much time was left in each chapter( which I normally do for audiobooks). True crime. Well written narrative on why one gets into the field. Beautifully written. Glad I spent every minute with the book. Interesting tale. But tone teeters on bombastic. Persisted because of the true crime element. And there is the engaging idea that crowd sourcing can work for crime solving. Review on www.Audible.com please listen to this book. Good read from Billy a Jensen on how he got started with true crime and instruction for others looking to follow in his path. loved the stories about Michelle MacNamara and then how he wove the development of that story in with the work he was doing. This book is exceptionally well done. It's refreshing and relatable because Billy's passion for justice is evident in his voice and words. I usually hate audiobooks, but I started an audible membership just to read this book.